If you’ve read my blog for a while, you know that I LOVE STEPHEN KING!! He grabbed my attention with Carrie way back in 1974 with Carrie and is still my very favorite author. Well guess what? Thanks to Trish @ Love, Laughter, and a Touch of Insanity, I learned that there will be a readalong for this monster of a book. Natalie @ Coffee and a Book Chick is hosting the Under The Dome Readalong!! Timeline is May 25 – July 27. Thanks to Tina @ Book Chatter, here is a link to the character bios!! Now to be honest I was wondering about this since the UTD show starts June 24th, but Natalie had a great idea which was to DVR the show and not watch it until after the readalong is finished. Sounds good to me! Show us your copy! Audio or print? Have you read Uncle Stevie before? Like I said above, I read Carrie in 1974 and was hooked, and I’ve read almost all of his books. What are you familiar with about Under the Dome or Stephen King? 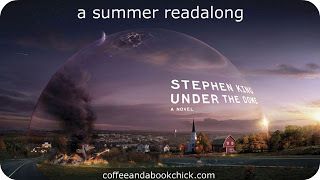 I’ve seen the book and tv show trailers, so I know a little bit about Under The Dome, as for Stephen King, I know he’s a brilliant author…and a little scary. I’ve never done a SK readalong, so I can’t wait! I also can’t wait for the show. Thanks for joining! Oh, you have the hardcover and I can’t imagine lugging that around! I have the soft cover and it still feels like it weighs five pounds, and I’m not looking forward to lugging that around the airport next week when I’m on business travel! So glad you’re joining along, this is going to be a fun ride on the crazy train! I thought about buying the ebook, but every King I’ve read has been hardcover, so I don’t want to break the streak. Yeah, I’m a little OCD! Oh, I would so love to do this! I just don’t know if I have the time. I have this book on my Nook and I’ve been dying to read it for the longest time. Good luck with it! I thought it would be really time consuming since it’s so big, but I did some calculating and it turns out that doing it for the time allowed for the readalong, it’s only about 17 pages a day with a little less the last day. I have never done a SK readalong either and am super excited! 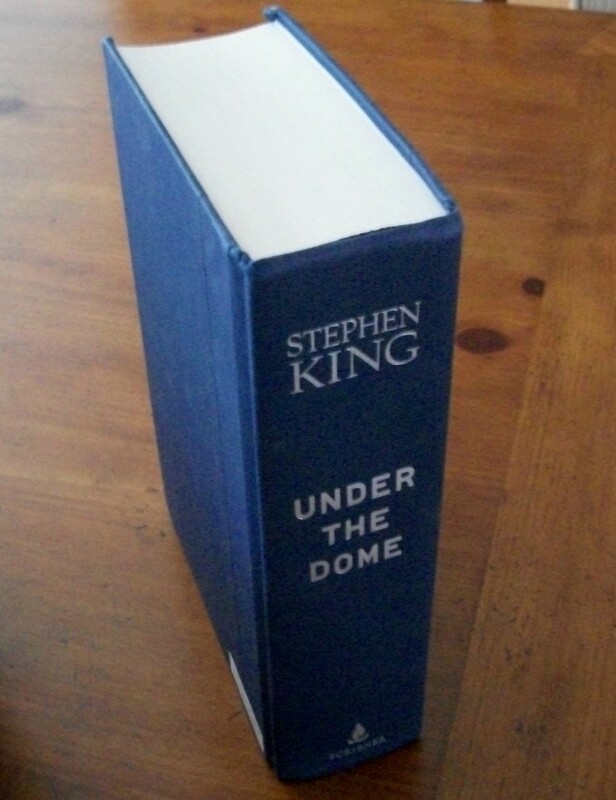 I have the hardcover copy of Under the Dome too. It’s sooooo heavy. 😛 Why lift weights when you have this? Yep, the book is so heavy sometimes my arms ache for hours after I put it down.